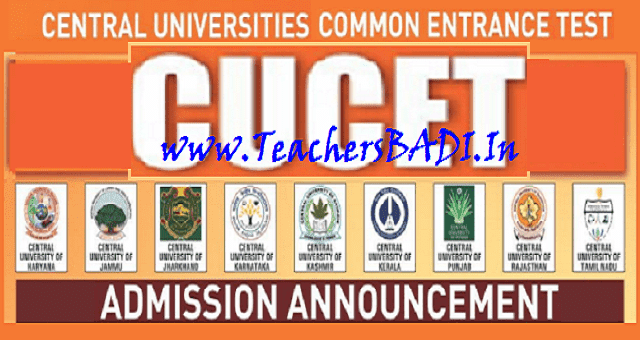 CUCET 2019 /Central Universities Degree, PG Common Entrance Test(CUCET) 2019, Central Universities UG, PG Entrance Test online application and Eligibility for all integrated and under-graduate programs/ Integrated/PG/Research Programs: Central Universities Common Entrance Test(CUCET) 2019 Notification has been released by the CUTET 2019 Officials. This Notification for admission into Integrated, Undergraduate(Degree), Post Graduate and Research Programmes in Seven Central Universities. There are various Integrated, Under Graduate, Post Graduate and Research Programmes available under and participating Central Universities(PUs). The Central Universities Common Entrance Test-2019 (CUCET-2019) exam is conducted jointly by the ten Central Universities namely Central University of Haryana, Central University of Jammu, Central University of Jharkhand, Central University of Kashmir, Central University of Karnataka, Central University of Kerala, Central University of Punjab, Central University of Rajasthan, Central University of South Bihar and Central University of Tamil Nadu, under the guidance of Central University of Rajasthan. This test is conducted for the students of 10+2, Bachelor Degree holders and Master Degree holders to obtain admission into the UG / Integrated Program / B.Voc., Post Graduate Program and the Research Program respectively in these ten Central Universities. The exam will be held on May 25 and 26, 2019. Last date to apply online : April 13. The admit card shall be issued on May 10. The results will be declared on June 21. Applications should be submitted online only. A candidate can apply for a particular programme for a maximum of three PUs with a maximum of three options of courses in each of the selected PU. The test is scheduled to be conducted at different centres across the country on May 25, 26. It is being held for providing admission into the UG/integrated programme/BVoc, post graduate programme and the research programme respectively in ten central universities. 2. Reservation of Seats as per Participating Universities (PUs) Norms. Students are strongly advised to refer to website of individual PU for reservation policy of respective University. 3. Various Integrated and Under Graduate Programmes are available under ten Participating Central Universities. 4. All applicants are advised to check the eligibility criteria thoroughly before applying for the programme, because, different universities have different eligibility criteria for similar courses. Hence, students will be themselves responsible if they opt for a course for which they are not eligible. 5. Applications should be submitted ONLINE only; OFFLINE applications will NOT be accepted. 6. Applicants are required to have a valid personal email ID and mobile number which should be kept active during the entire admission process, so that the university may send alerts, important communications etc. regarding entrance test on them. Under no circumstances, should the candidate share/ mention his/her email ID with any other person. Reservation of Seats – as per Government of India / University norms. 10. As all communication will be made through email and SMS, please ensure that DND (Do Not Disturb) is not activated on your mobile. Eligibility for all integrated and under-graduate programmes is successful completion of 10+2 or equivalent. Candidates who have appeared for the final examinations are eligible to apply. Eligibility for all integrated and post-graduate programmes is successful completion of graduation or equivalent, Eligibility for all Research Programmes (Integrated / M.Phil./Ph.D.) is successful completion of a post-graduate or equivalent degree examination. Candidates who have appeared for the final qualifying examinations are eligible to apply. Applications should be submitted Online Mode only. Offline applications will not be accepted. All candidates are advised to check the eligible criteria thoroughly before applying for the course, because different universities have different eligibility criteria for similar courses. Hence, students would be themselves responsible if they opt for course for which they are not eligible. Applicants are required to fill in the details asked in the form carefully without making any spelling mistake. On submission of Online application successfully, applicants can make the payment for their selected programme by online or offline mode of payment. A candidate may fill the form partially and login again to complete it as early as possible. Candidates will receive SMSs and email alerts at the time of registration and completing registration. 1. Applicants should be ready with his/her good quality and latest digital photograph and signature of size between 10KB - 100 KB and 5KB – 20KB while applying, the detailed information about which has been given above in the GUIDELINES TO UPLOAD PHOTOGRAPH AND SIGNATURE. 2. Applicants are required to fill in the details in the form carefully without making any spelling mistakes. On submission of online application successfully, applicants can make the payment for their selected programme by Online or Offline mode. 3. An applicant can fill the form partially and login again to complete it as early as possible. 4. Test Centre cities – Each candidate should choose Test Centre City of his/her choice from cucet2019.co.in. Change of Test Centre City will not be permitted after submission of application form. In case, less than 100 candidates register for a particular centre, it will be cancelled and the candidates will be required to appear at nearby centre allotted by CUCET-2019. 5. Applicants will receive SMS and Email alerts at the time of registration and also after completing the registration. 6. A candidate can apply for a particular programme for a maximum of three PUs with a maximum of 03 options of courses in each of the selected PU. 7. In case a candidate wishes to opt for more PUs with additional (extra) course(s), he/she can opt for “Add-On” option by paying prescribed fee again. 8. If an applicant pays the examination fee through Offline Challan mode of SBI, the bank charges (as levied by the bank) will be borne by the candidate. 9. Candidates are allowed to appear for CUCET-2019 provisionally subject to the final verification of mark sheets/degrees/certificates, validity of certificates/mark sheets of qualifying examination and also of non- involvement in the adoption of unfair means in any of the University Examinations/ Entrance Tests held earlier, at the time of admission. 10. The candidates appearing in the qualifying examination can also apply for CUCET-2019, but at the time of admission counselling, he/she will have to produce the mark sheet/degree about their fulfilling the eligibility criteria. 11. Mere appearance in the Entrance Test for securing pass marks at the CUCET-2019 does not entitle a candidate to be considered for admission to the Course applied unless he/she fulfils the eligibility criteria/conditions. APPLICANTS MUST FULLY SATISFY THEMSELVES ABOUT THEIR ELIGIBILITY AS PRESCRIBED, BEFORE FILLING IN THE APPLICATION FORM. (i) Minimum eligibility requirement are not fulfilled. (i) False documentation has been done, or, facts have been suppressed. (ii) Any other similar valid reason. 13. Candidates admitted to any Course in the concerned University shall not be eligible to pursue simultaneously any other full-time course in this or in any other University/ Institution. (ii) Part B: Domain Knowledge – comprising of 75 MCQs. This part may consist of one/two/three or more sections. Each section can have 25 or more questions. A candidate is required to answer a set of ‘X’ sections (75 questions) as specified on the front cover of the Test Question Booklet. However, he must ensure that he fills right circles in the OMR Sheet corresponding to the question numbers attended. (iii) For example, Part B of Entrance Test-Paper (eg. UGQP01) shall consist of four sections i.e. Physics, Chemistry, Mathematics and Biology comprising 25 questions each. A candidate shall be required to attempt any three sections with combination of either PCM or PCB. While choosing the combination the candidate must ensure that he/she has appeared in respective subjects at 10+2 or Pre-board or equivalent qualifying exam. (iv) If an Entrance Test-paper contents X number of sections and a candidate is required to answer Y number of section but if a candidate attempt all ‘X’ sections then best of ‘X’ sections as per instructions on the question booklet will be considered for preparation of Merit list. (v) For Admission to some Integrated Courses/B.Voc./MBA/MCA/LLB or any other general course(s), only one paper comprising of 100 MCQs covering English language, reasoning, data interpretations/ numerical ability, general awareness and analytical skills will be held. (vi) The candidate will have to choose one correct answer and mark on OMR Sheet. However if a candidate marks multiple entries in the OMR Sheet for particular question(s), it will be treated as wrong answer with negative marking. (vii) Each paper will be only of Two Hours Duration. (Viii) There will be negative marking in CUCET-2019. Each correct answer will carry 01 mark and for each wrong answer, 0.25 mark will be deducted. Questions not attempted will not be assessed and hence will not be considered for preparing final merit list.